I’ve selected a winner for the giveaway, and it’s Lisa! Congratulations Lisa, I sent you an email to get your address. FYI, I used the random number generator to get the winner, which gave me 54, and counted down the comments to that commenter number. I was going to print all of the comments but there was no easy way to do it. Oh well! To everyone who commented, tweeted and facebooked–thank you! That was fun. Lately I’ve had a bit of a knitting obsession. I think it’s because I work in a yarn shop. And I have a lot of leftover yarns from design projects. And I really try to be good about using what I have. And sometimes if I have already crocheted something with a yarn, well, I want to do something entirely different with the rest of it! And also, knitting takes less yarn when it comes to garments (and I’m not small). Heck, there’s no need to justify my love of both needle crafts, is there? Anyway, I had a few hanks of Malabrigo Rasta left from a recent project–lucky me, right? 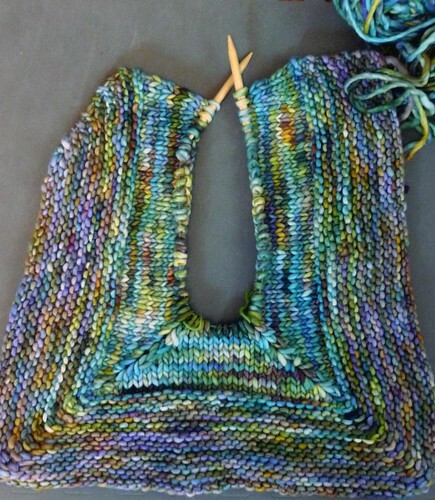 So I searched Ravelry to see if I could make anything with said bulky deliciousness. Because you know this Texan will get a ton of wear out of a superbulky garment, and really enjoy knitting it during the 100 degree heat we’ve been experiencing lately. Oh yes. My search led me to this Cropped Cardi pattern (ravelry link) from Knit.1 Winter 2008. The mag is sadly defunct, and I remember hemming and hawing over buying that last issue when it was on newsstands because it had a lot of awesome designs but I wasn’t a fantastic knitter at that point. I ended up not purchasing it, and then wanting to get a back issue, but it had sold out by then so I forgot about it. When I saw the cardigans that had been knit up on ravelry, I really wanted the entire issue (because there’s also this other cardigan, oh and this one and this one that I’m interested in) and I was lucky enough to snag a copy on E-bay– woot! (In case you’re lusting, you can also buy individual patterns in the Vogue Knitting Store). I cast on for the Cropped Cardi the day that the magazine came in the mail, which was Monday, I think. This is an easy and super quick knit. The photo above was my progress on Tuesday night, last night I finished the left half of the sweater. The construction is really fun, and I’ve got my fingers crossed that it will be flattering. Or at the least, not a knitted fat suit–I could use one of those just about as much as I could use a bulky vest in TX. I’m concerned, but plowing through with reckless abandon because sometimes you just have to stick with something in order to know. And honestly? I wouldn’t mind re-knitting these 500 yards of yarn. It’s just so squishy and lovely! I’ll let you know how it turns out. Every one liked very much all my little creations. Thanks so much for your nice note! I'm glad that crocheting can bring some peace and creativity to your life and happy to have helped in my own small way. Keep at it and with practice you'll be able to learn both crochet and knitting. And please remember while taking care of your parents, to also take care of yourself! That's some pretty stitchin', lady! All of these rumors I hear about Malabrigo must be true. I shall embark on a mission to find it here in Mexico! 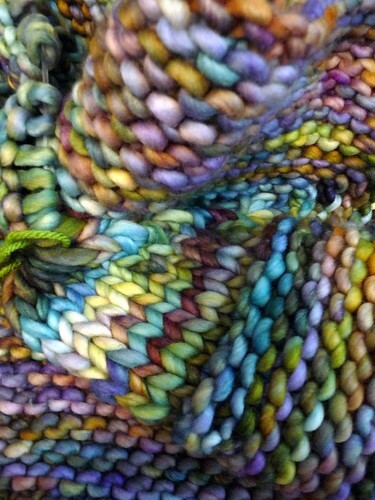 Oh my gosh that yarn is just gorgeous! I love those colors!